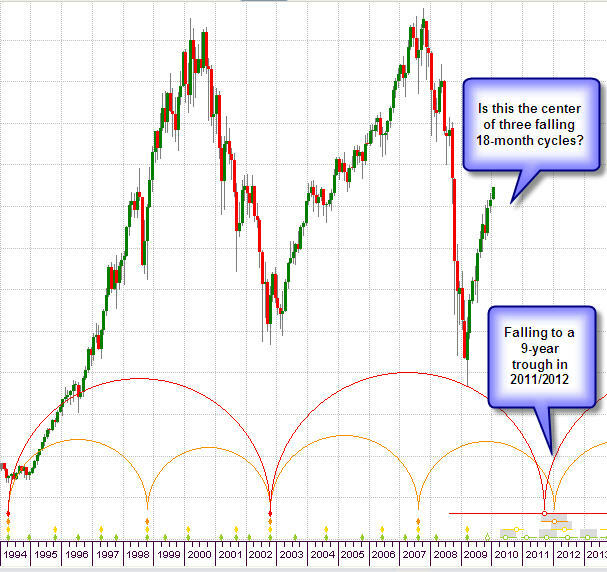 The Hurst Trader » Blog Archive » Is the Stock Market about to Peak? » Title: Is the Stock Market about to Peak? » Filed Under: Calling the Market. I keep telling myself that I should stick to the software side of things, and let those with more market analysis experience actually do the analysis! But I am seeing such overwhelming evidence that the US stock market is about to turn down, that I cannot keep quiet about it. I have sent emails to all those friends and family who trade or invest, but I have been greeted mostly as some sort of a lunatic (poor old David, he’s been staring at those charts of his for too long …), so I thought I’d express myself here, where I might be considered a lunatic, but at least most of you have been polite about it (and perhaps share some of the lunacy)! Here is an analysis of the S&P 500 index, performed by THT using the commonality model, which I have been keeping my eye on recently, mostly to see how the commonality model is shaping up. 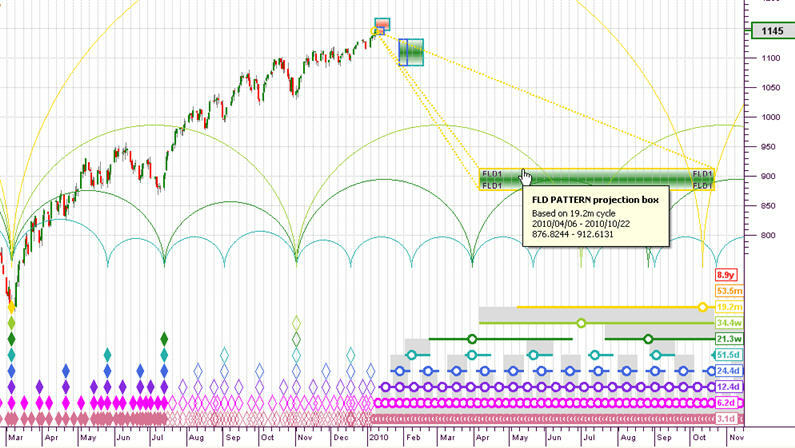 Using the new ability of THT to show multiple cycle FLD Pattern Projection boxes, I am here showing the projection boxes of both the 40-day and 80-day cycles. You can see that THT is expecting a peak (which will probably be synchronous in this case) of both the nominal 40-day and nominal 80-day cycles. This should happen soon, possibly within the next week. It could even happen over the weekend of the 9th & 10th of January. That in itself is no cause for alarm, because a turn down of the 40-day and even the 80-day cycles are hardly a reason to be sounding alarm bells, and sending unsolicited (and in most cases unwelcome) emails. THT indicates that it believes the 18-month cycle (which last troughed in early March 2009) has now formed a peak, and is turning down … likely to carry prices down to the 900 level, which is a 22% drop in value. That is more reason to be raising the alarm, but the main reason that I feel like shouting from the rooftops is because of the even longer term picture. I am also intrigued by how Cyclic Theory fits in with Elliott Wave Theory (EWT proposes a fractal price movement which consists of 8 waves, 5 in an “impulse” and 3 in a “correction” – a composite of 3 cycles with a 2:1 harmonic ratio would also give 8 waves). 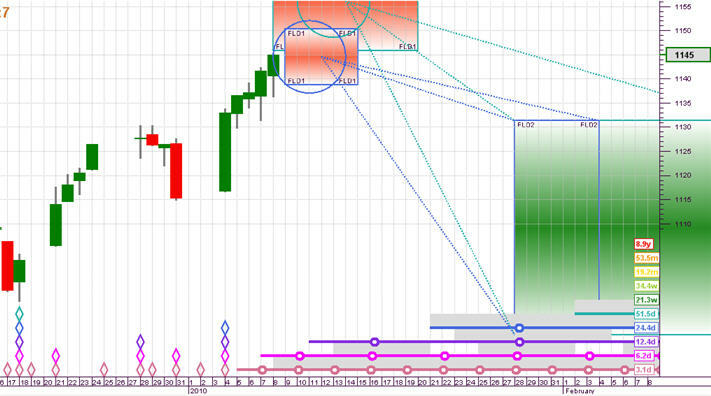 I believe our current position is similar to being at the end of a wave 2 upward correction in a bearish impulse wave. Coming next would be wave 3 down, notorious for being the most dramatic and powerful of all 5 waves. Of course I realise the irony of my position. If THT’s analysis turns out to be correct, that would be a triumph for THT, but a disaster for us all because of the economic decline that this analysis implies. On the other hand, if this analysis is wrong, then that would be a failure for THT, but good news for us all economically! I would love to hear what others think about this. Rather than leave a comment hear, reply to the post on the Hurst Trader Forum. It would be nice if you “updated” this post by adding data and further analysis since the last posting date. It would be instructive for readers to compare what you said then to what has happened and what you say now. Also, I and many others think we really are on the cusp of a major drop in prices. You may not have the time for this, but especially for new people, this kind of summary and display of the software via specific example, the software’s graphics and terminology, and its performance will all serve to gain more advocates and supporters. Sometimes we tend to get involved in the details of implementation at the expense of clearly showing the results and methods at a higher, summarized level. I know you have the webinars, but consolidating it to a report like this last one works better [in my view] for beginners. And even though it may negatively impact when you have time to get to MW wave analysis, I think updating this site at points where it appears that a major apex is forming is time well spent. Agree with David’s comment. As a new user, it would be helpful to have somewhat current info to view. Having current info would help to confirm if a new user’s understanding of the concepts are correct. Currently with outdated info, one must move from one time reference to another. Considering learning the software and models are somewhat complex, it would be helpful to a new user. Has the peak been due to the 73% fundamental component that Hurst describes in his theory? I think this discussion could be pretty interesting and not necessarily impact the validility of Hurst’s theory.